It's time to make your hotel reservations! Check out the conference location and hotel and book today. 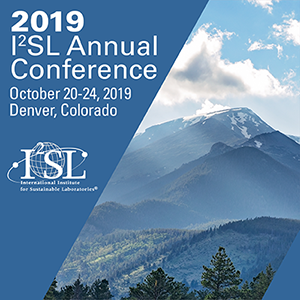 Exhibit with us at the 2019 I2SL Conference! Space is limited, so sign-up today. NEW in 2019! 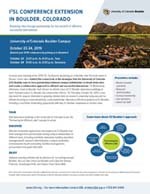 Extend your conference experience and head to the University of Colorado-Boulder on Wednesday for tours and Thursday for a day of technical sessions focused on the collaboration and partnerships among campus stakeholders needed to foster an efficient laboratory. Want to access presentations from the 2018 conference? Check out the Annual Conference Presentations Archive, available to I2SL Members through the Member Portal. 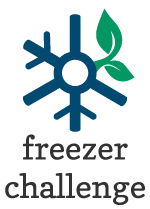 I2SL is proud to offer the 2019 International Laboratory Freezer Challenge in conjunction with My Green Lab to promote efficient, effective sample storage for laboratories around the world. Learn more about this year’s challenge and sign up before May 15 to participate! Special thanks to our 2019 cosponsors: Eppendorf, Panasonic Healthcare Corporation Biomedical, Stirling Ultracold, and Thermo Fisher Scientific. Are you interested in starting an I2SL Chapter in your region? Let us know and we will connect you to other industry professionals in your region as well as other chapter officers to help you successfully kick off a new I2SL Chapter. Learn about the Bringing Efficiency to Research (BETR) Grants program, which is an ongoing focus of the I2SL University Alliance Group (UAG). The Continuous Improvement Working Group, formerly known as the Laboratory Continuous Performance Improvement Program, is developing tools and a process for continous improvement in new and existing laboratory facilities. The Benchmarking Working Group assisted in the development of a benchmarking database tool to replace the old Labs21 benchmarking database with a lab-specific portal to the U.S. Department of Energy’s (DOE's) Building Performance Database, including beta testing the new tool. Check it out! Check out the new and improved Laboratory Benchmarking Tool, sponsored by the Federal Energy Management Program and developed by I2SL, kW Engineering, and Lawrence Berkeley National Laboratory. Smart Lab Accelerator partners and others will be attending the U.S. Department of Energy's Better Buildings Summit, July 10-11, in Arlington, Viriginia. Harvard University got several of its laboratories to go green by giving green. Read the case study about how financial incentives helped reduce lab energy intensity. I2SL, with Alison Farmer, Ph.D., kW Engineering, and Matt Gudorf, University of California, Irvine, collaborated to produce a new Best Practices Guide: Energy Efficiency Projects and Principal Investigators. The guide offers expert advice for cultivating cooperation and communication with key lab personnel throughout the retrofit process so that lab construction is not a major disruption. Operations and maintenance (O&M) training courses are available now at a discount to I2SL members. Core facilities are the latest trend in consolidating campus research facilities and equipment to save resources and maximize researchers' abilities. Read more about how they work at Northwestern University or watch a video about core facilities. The University of Virginia recently completed a Pilot Lab Program to study the true potential of holistic Green Labs programming that addresses both building and user aspects of research efficiency. Build your laboratory and other high-tech facility expertise with resources on the Laboratory Basics page. Interested in a career in architecture? Check out these job listings on the Association of Collegiate Schools of Architecture website. I2SL also occasionally posts job opportunities. Check out the latest opportunities here. Register for upcoming I2SL High-Tech Talks Webinars to discover new tools, innovations, and technologies being utilized in the high-tech facility community. Get I2SL updates on social media!